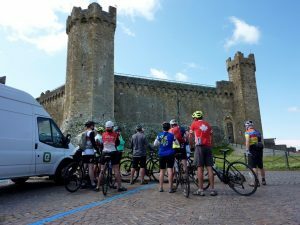 Finally, a report on the amazing cycling trips EBTCers participated in this past spring. Our Tuscany trip began on May 14 at the designated meeting point: the Pisa Airport in Italy. It was so ‘cool’ to see EBTCers getting together so far from Edmonton. Four non-EBTC cyclists, two from Sherwood Park and another two from PEI, rounded out the Canadiana in our group of 16 riders. Exodus transferred us from the airport, via a large van (small bus?) and car, to our lovely hotel in the quaint town of San Quirico. That first afternoon was ours to explore by foot the historic aspects contained within the old town walls … and of course begin tasting the great wines, cheeses, and gelatos of the region! 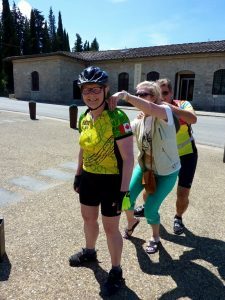 Our cycling started the next morning but not before doing an ‘M Check’, a pre-ride safety review our guide required us to perform each day; quick, easy, and a valuable practice! The cycling involved expending significant energy navigating what our guides called undulating roads (it felt more like constant up-ulating at times!). Turned out, though, that the ‘up’ side of the undulating topography was that it was critical in helping us burn off at least some of the quantity of food and beverages consumed. We started each day with a great continental breakfast, followed by a mid-morning coffee (which the Italians sure do know how to make! ), then lunch (and a beer or wine), and perhaps a mid-afternoon gelato (or beer or wine), and of course dinner (and/or beer or wine!!). Caroline seemed to recognize that all the eating and riding … and riding and eating … might have the potential to aggravate joints and muscles. So, as a preventative measure, she created the ‘Macarena Massage’ complete with song, dance, massage, and group participation. 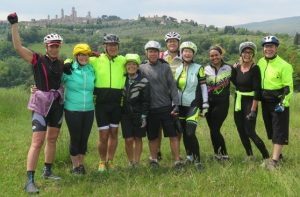 Our rides took us through Pienza (pecorino cheese capital) and Montipulciano and Montelcino (Brunello wine anyone?) as well as the Chianti region. Every day had us oohing and ahhing at the magnificent vistas encountered around every corner and from each hilltop. 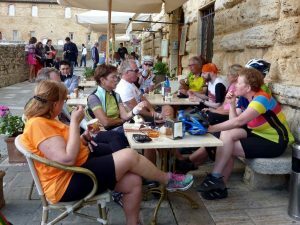 Our journey took us on part of the same routes as the Giro d’Italia and the L’Eroica rides. 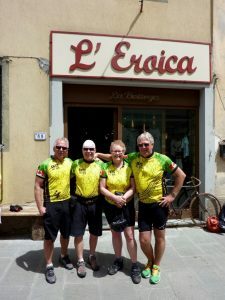 Some members of our group were going to purchase L’Eroica cycling jerseys but were concerned that the logo looked too close to L’Erotica so they stuck with the EBTC Anniversary Jerseys! Each of us has a different perspective but the highlight of the trip for me was the architectural magnificence of the cathedral in Siena which could only have been realized in person because the pictures I’ve seen do not come close to doing it justice. We had a great group and I’m thinking this might be one of those trips that I know I would certainly consider doing again … so much to absorb. If you are considering this trip in the future, a half-day in Pisa at the start of the trip is suggested to see the Leaning Tower (half day is plenty) and perhaps adding a couple of days in Florence at the end of the trip to visit the various sites there. Ciao! P.S. – We learned from our PEI counterparts on this trip that there is a GranFondo in late August during lobster season (check it out at: http://granfondo-pei.ca/). P.P.S. – We need to talk Terry Fannon into putting together a ‘Packing 101’ course; he’s got the minimalist thing down to a science!